I walk past Maelbeek metro station every morning. I was nearby when a terrorist blew it up, along with himself and 20 others, on that horrible morning in Brussels. So I rubbernecked my way to the scene, live streaming what I saw via Periscope on Twitter. When I got the call on my (unlisted) phone from a CNN producer in Hong Kong, I had to pause the live stream to answer it. I later realised that I should have kept on streaming, because the conversation with the producer was far more interesting than my tepid phone interview with the CNN anchors. Three CNN producers from three different continents called me that day requesting live interviews. I did the first one but felt too icky to do any more. That’s because the conversation with the producers went something like this. CNN: A journalist friend of yours, I think his name was John something…? Me: I don’t know any journalists by that name. 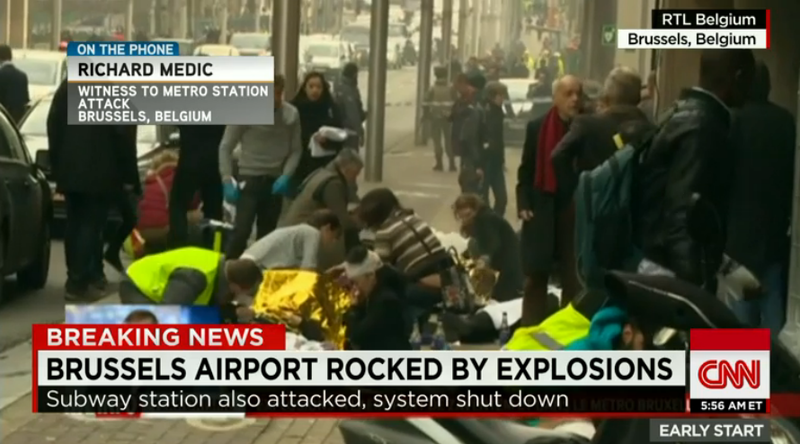 CNN: Can you say you were in the subway during the attack? Me: No, I was walking past the station around half an hour after the attack. CNN: Oh. Can you say you arrived “moments after” the explosion? Me: That would be a stretch wouldn’t it? CNN: Oh. Can you say you saw any dead or injured? CNN: But you’re still at the scene now, right? Me: I’m live streaming from a hundred metres down the road, behind a police cordon. CNN: OK then…can you tell us on air what you’re seeing? Me: Not seeing much. But yes OK. When I did the live interview with the CNN anchors over the phone, they didn’t introduce me as a bystander who’d arrived half an hour after the explosion, but as a “witness to the metro attack”. It didn’t take the anchors long to realise their producer had found a rubbernecker, not a witness. I was tempted to make the on air interview as awkward as my earlier conversation with the producer was absurd. But I gave them something to milk instead. I walk past here every morning to take my daughter to daycare, I told them. She’s two years old. I didn’t have to mention her age or translate crèche for an American audience. But the former spokesman in me couldn’t help but offer something to my fellow rubberneckers grazing at home. The anchors played along, wrapping up our moo-moo of an interview with a line about hugging my daughter a little tighter that night. You don’t get to be “the most trusted name in reality TV news” without adding some flavour to the milk. Richard Medic is chief of happenings at happeningo digital agency and founder of Soonfeed, the world’s first timeline of live happenings on the web.